Palo Alto, 8 May 1846. Conditions had been steadily worsening along the Rio Grande. The United States claimed the Rio Grande as the international border while the Mexican Government claimed the Nueces as the proper border. Early in 1846, General Zachary Taylor built a fort on the Rio Grande opposite the Mexican town of Matamoros. In April, the Mexicans countered by sending a force of approximately 1600 cavalrymen across the Rio Grande where, on 25 April, they overwhelmed a force of 60 dragoons under Captain S. B. Thornton. Mexican forces at Matamoros had increased by April. By the end of that month, General Taylor had become concerned about his lines of communication with his lightly held main base at Point Isabel, near the mouth of the Rio Grande. Therefore, on 1 May, Taylor moved the bulk of his army to Point Isabel, leaving a small detachment of artillery and infantry under Maj. Jacob Brown at the fort opposite Matamoros. The Mexicans soon placed this fort (later named Fort Brown) under heavy attack. On 7 May, Taylor advanced toward the fort with about 2,300 men. On the morning of 8 May, about half the distance to the fort, the Americans engaged the enemy, an estimated force of 6,000 men commanded by Gen. Mariano Arista. (Its right flank rested on an elevation known as Palo Alto; which the engagement was named.) Taylor moved unhesitatingly into battle, using his artillery to cover the deployment of the infantry. The engagement continued until nightfall, when the Mexicans withdrew. Effective use of artillery fire was largely responsible for the American victory. American losses were 9 killed and 47 wounded. The Mexicans suffered more than 700 casualties, including an estimated 320 killed. Resaca de la Palma, 9 May 1846. The next morning, Taylor, continuing his advance, found the Mexicans a few miles down the road, where they had taken up a strong defensive position in a dry river bed known as the Resaca de la Palma. In this second successive day of battle, the infantry conducted most of the action, although the dragoons played an important role by engaging and defeating the enemy artillery. Eventually the infantry turned the enemy's left flank, and the Mexican line broke and fled. The rout became a race for the Rio Grande which the Mexicans won, but many were drowned while attempting to cross the river. Taylor's losses were 33 killed and 89 wounded. Arista's official report listed 160 Mexicans killed, 228 wounded, and 159 missing. The Americans, however, estimated that the Mexicans had suffered well over a thousand casualties. Taylor had to wait until 18 May for boats to move his army across the Rio Grande. When the Americans finally moved into Matamoros, they found that the Mexican force had disappeared into the interior. The next objective was Monterey, but the direct overland route from Matamoros lacked water and forage; Taylor therefore waited until August for the arrival of steamboats, with which he transported his army 130 miles upriver to Camargo. Meanwhile, thousands of volunteers had poured into Matamoros, but disease and various security and logistic factors limited Taylor to a force of little more than 6,000 men for the Monterey campaign. Mexican-American War Timeline of Battles. Monterey, 21 September 1846. Taylor's forces left Camargo at the end of August and launched an attack on Monterey on 21 September 1846. The city was defended by a force of 7,300 to 9,000 Mexican troops under the command of Gen. Pedro de Ampudia. After three days of hard fighting, the Americans drove the enemy from the streets to the central plaza. On 24 September, Ampudia offered to surrender the city on the condition that his troops be allowed to withdraw unimpeded and that an eight-week armistice go into effect. Taylor, believing that his mission was simply to hold northern Mexico, accepted the terms and the Mexican troops evacuated the city the following day. Ampudia reported that his army had suffered 367 casualties in the three-day fight. Taylor reported his losses as being 120 killed and 368 wounded. Both reports were probably underestimates. Taylor was severely criticized in Washington for agreeing to the Mexican terms, and the Administration promptly repudiated the armistice, which had almost expired by the time the news reached Monterey. Meanwhile, in keeping with the strategic plan, the other two prongs advanced into northern Mexico and were ordered into action. On 5 June 1846, Brig. 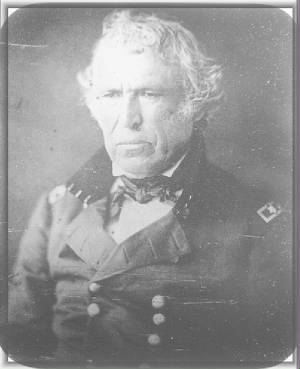 Gen. John E. Wool had left San Antonio with his "Army of the Center," a force of 2,000 men. His original objective was Chihuahua, but en route it was changed to Parras. Wool, encountering no opposition, arrived at Parras on 5 December; his force then became part of Taylor's command. The third prong, Col. (later Maj. Gen.) Stephen W. Kearny's "Army of the West," a force of about 1,660 men, left Fort Leavenworth early in June 1846 and entered Santa Fe unopposed on 18 August. From there, Kearny left for California on 25 September with about 300 dragoons. En route, he met a party, led by Kit Carson, bringing news from the west coast that a naval squadron under Commodore J. D. Sloat--with the questionable help of volunteers under Capt. John C. Fremont--had won peaceful possession of California in July; although some opposition remained. Kearny sent back 200 of his men and pushed on with the rest, arriving at San Diego on 12 December after having fought a sharp engagement on 6 December against a larger force of Californians at San Pasqual. At San Diego, Kearny joined Commodore Robert F. Stockton (who had replaced Sloat), and their combined force of about 600 men, after same minor skirmishing, occupied Los Angeles on 10 January 1847. Three days later the last remaining Californian opposition capitulated to the volunteer force commanded by Fremont. Meanwhile, in mid-November of 1846, Taylor had ordered one of his divisions to occupy the city of Saltillo. Another detachment occupied Victoria, a provincial capital between Monterey and the port or Tampico, which had been occupied by an American naval force under Comdr. David Conner on 15 November 1846. Thus, by the end of 1846, a very large part of northern Mexico had come under American control. 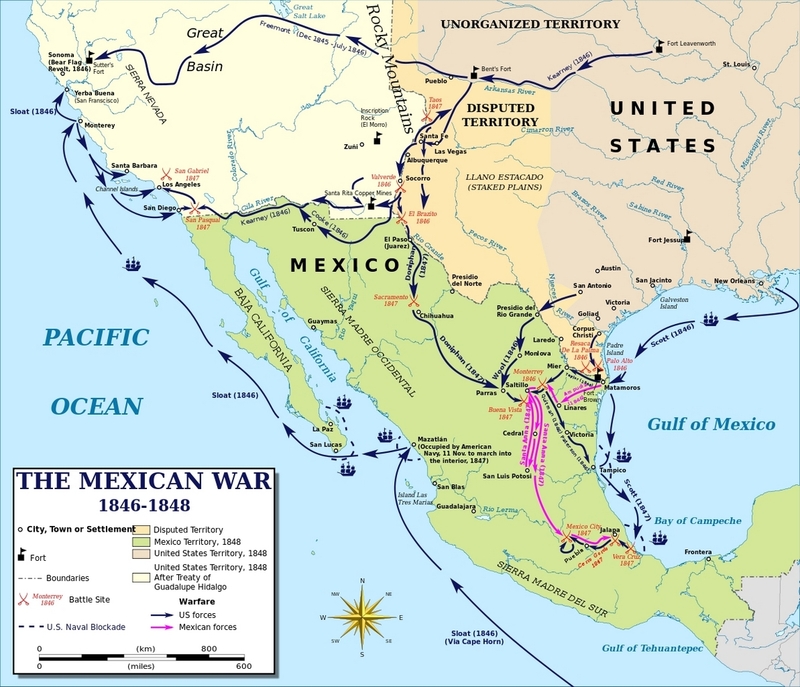 A plan was adopted late in 1846 to strike at Mexico City by way of Vera Cruz. 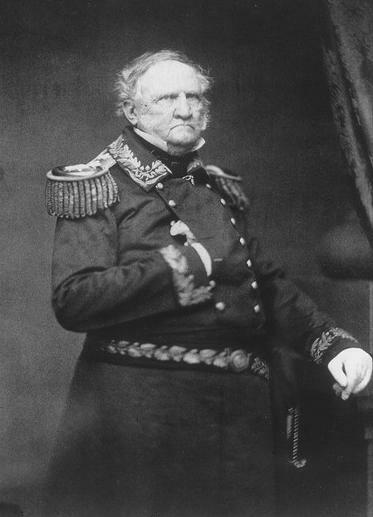 In preparation for this expedition, General Winfield Scott, Commanding General of the Army, detached about 8,000 men from Taylor 'a command early in 1847, ordering the troops to Gulf ports to wait sea transportation. Taylor was left with 4,800 men, practically all volunteers, most or whom he concentrated in a camp south of Saltillo. Buena Vista, 22 - 23 February 1847. Gen. Antonio López de Santa Anna, aka Santa Anna, President of Mexico, had meanwhile taken the field personally and assembled an army at Son Luia Potosi. Learning of the weakness of the forces near Saltillo in February 1847, Santa Anna forwarded his estimated force of 15,000 men. Taylor hastily redeployed his force at Buena Vista, where the terrain offered better possibilities for defense. Santa Anna used French tactics at Buena Vista, attempting to overwhelm American positions with dense columns of men. Massed tires of infantry and artillery proved effective against the attacking columns, and, after two days of the most severe fighting of the war, Santa Anna withdrew his dispirited army to San Luis Potosi, having suffered from 1,500 to 2,000 men killed and wounded. The Americans, too exhausted to pursue, had lost 264 killed, 450 wounded, and 26 missing. Vera Cruz, 9 - 29 March 1847. Scott's army of 13,660 men rendezvoused at Lobos Island late in February 1847. On 2 March, it sailed for Vera Cruz, convoyed by a naval force under Commodore Matthew C. Perry. Landing operations near Vera Cruz began on 9 March. This first major amphibious landing by the U.S. Army was unopposed, because the Mexican commandante general, Juan Morales, had held his force of 4,300 men behind the city's walls. In order to save lives, Scott chose to take Vera Cruz by siege rather than by assault. The city capitulated on 27 March 1847, after undergoing a demoralizing bombardment. The Americans lost 19 killed and 63 wounded. The Mexican military suffered about 80 casualties. Cerro Gordo, 17 April 1847. Scott began his advance toward Mexico City on 8 April 1847. The first resistance encountered was near the hamlet of Cerro Gordo where Santa Anna had strongly entrenched an army of about 12,000 men in mountain passes through which the road led to Jalapa. Scott quickly won the battle with a flanking movement that cut off the enemy escape route, and the Mexicans surrendered in droves. Results: From 1,000 to 1,200 casualties were suffered by the Mexicans. Scott eventually paroled an additional 3,000 that had been captured. Santa Anna and the remnants of his army fled into the mountains. American losses were 64 killed and 353 wounded. Scott quickly pushed on to Jalapa, but was forced to wait there for supplies and reinforcements. After some weeks, he advanced cautiously to Pueblo. Wounds and sickness had placed 3,200 men in the hospital. In addition, 3,700 volunteers (seven regiments), whose enlistments had expired, departed for home. The ramifications: It left Scott with only 5,820 effectives at the end of May 1847. Scott remained at Puebla until the beginning of August, awaiting reinforcement and the outcome of peace negotiations--which were being conducted by Nicholas P. Trist, a State Department official who had accompanied the expedition. The negotiations failed, so Scott boldly advanced toward Mexico City on 7 August, thus abandoning his line of communications to the coast. By this time, reinforcements had brought his army to the strength of nearly 10,000 men. Santa Anna had disposed his army in and around Mexico City, strongly fortifying the many natural obstacles that lay in the way of the Americans. Contreras, 18 - 20 August 1847. Scott first encountered stiff resistance at Contreras where the Mexicans were finally put to flight after suffering an estimated 700 casualties and the loss of 800 prisoners. Churubusco, 20 August 1847. Santa Anna promptly made another stand on Churubusco where he suffered a disastrous defeat in which his total losses for the day—killed, wounded, and especially deserters—were (probably) as high as 10,000. Scott, however, estimated the Mexican losses at 4,297 killed and wounded, and 2,637 prisoners. Of 8,497 Americans engaged in the almost continuous battles of Contreras and Churubusco, 131 were killed, 865 wounded and about 40 missing. Scott proposed an armistice to discuss peace terms. Santa Anna quickly agreed; but after two weeks of fruitless negotiations it became apparent that the Mexicans were using the armistice merely for a respite. On 6 September, Scott canceled the negotiations and prepared to assault the capital. To do so, it was necessary to take the citadel of Chapultepec, a massive stone fortress on top of a hill about a mile outside the city proper. Defending Mexico City was from 18,000 to 20,000 troops, and the Mexicans were confident of victory, since it was known that "Scott had barely 8,000 men and was far from his base of supply." Molino del Rey, 8 September 1847. On 8 September 1847, the Americans launched an assault on Molino del Rey, the most important outwork of Chapultepec. It was taken after a bloody fight, in which the Mexicans suffered an estimated 2,000 casualties and lost 700 as prisoners, while perhaps as many as 2,000 deserted. The small American force had sustained comparatively serious losses—124 killed and 582 wounded—but they doggedly continued their attack on Chapultepec, which finally fell on 13 September 1847. American losses were 138 killed and 673 wounded during the siege of the fortress. 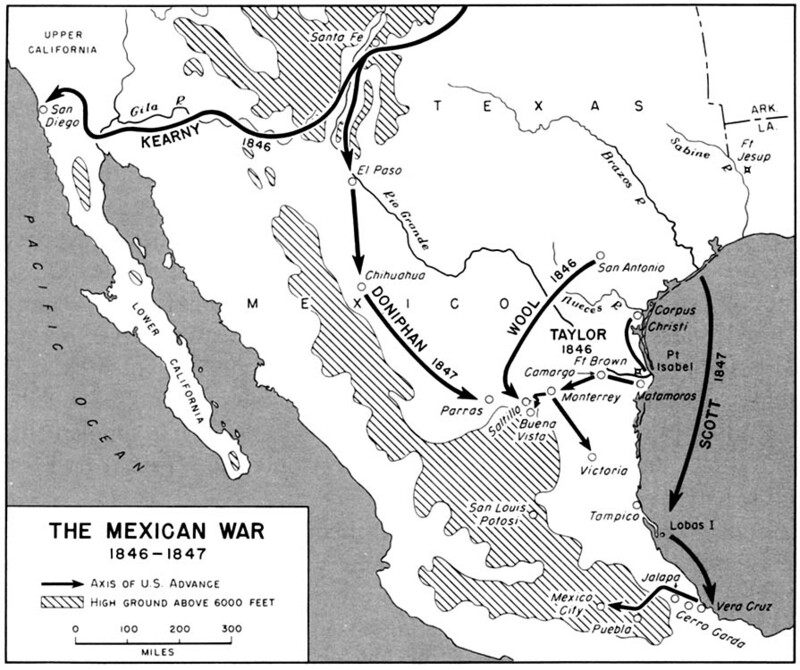 Mexican losses in killed, wounded, and captured totaled 1,800. The fall of the citadel brought Mexican resistance practically to an end. Authorities in Mexico City sent out a white flag on 14 September 1847. Santa Anna abdicated the Presidency, and the last remnant of his army, about 1,500 volunteers, was completely defeated a few days later while attempting to capture an American supply train. On 2 February 1848, the Treaty of Guadalupe Hidalgo was signed, ratified in the U.S. Senate on 10 March 1848, by the Mexican Congress in May, and on 1 August 1848, the last American soldier departed for the United States. Subsequently, Mexico and the United States signed and ratified the Gadsden Purchase. The Treaty of Guadalupe Hidalgo and the Gadsden Purchase were reflected in the United States' policy of Manifest Destiny.